When we are able to start our day with a complete breakfast, disconnect for a lunch break, and make time for movement throughout our work day, we are able to reconnect with our bodies and eat adequately. By promoting a mindful and intuitive approach in the workplace, we are able refuel and refocus to increase work productivity, improve employee engagement, and optimize our long term health. Gisela Bouvier is a Corporate Wellness Dietitian and owner of Mindfully Intuitive Nutrition in Southwest FL. 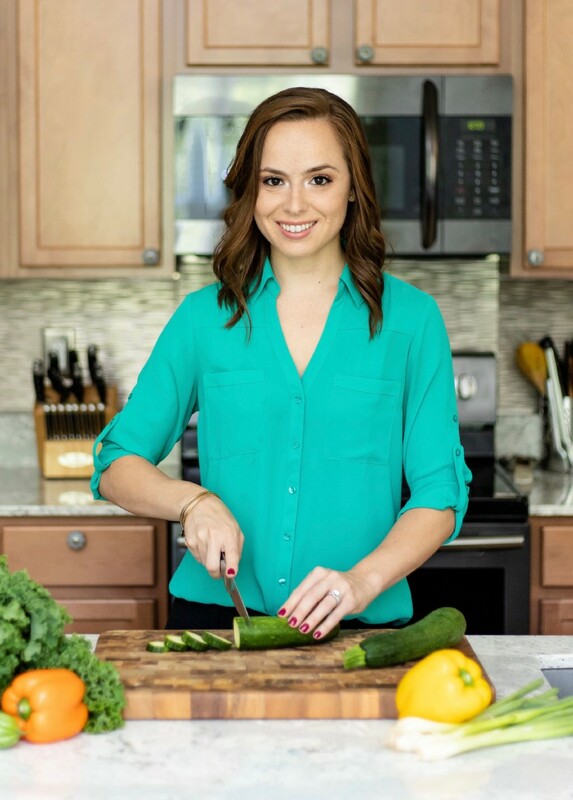 She graduated with a Dietetics and Nutrition degree from Florida International University in 2008 and received her Master’s in Business Administration from Saint Leo University in 2014. Mindfully Intuitive Nutrition is a Nutrition Consulting Company, creating Employee Wellness Programs, with a Mindful and Intuitive Eating approach. Gisela’s programs are the first of its kind, focusing on making nourishment a priority in the workplace once again. I have been a Dietitian for over 10 years. I started my business just over 2 years ago. Initially, I focused on doing one-on-one counseling, primarily with women, and guiding them to amend their relationships with food through Mindful and Intuitive Eating. However, one day I was approached by a company to present a Nutrition Workshop. They said I could focus on anything I wanted to talk about. I presented and discussed how Mindful and Intuitive Eating are not only lacking in the workplace, but they are also essentially needed. It was then that the organization asked me to do a full Wellness Program for them because it was the first time a practitioner’s message was “Focus on what is going to help YOU” and not “You HAVE to eat this or CAN’T eat that.” It was at that moment that I found my niche in Employee Wellness. Mindful Eating is about eating with intention, while paying attention. Intuitive Eating means to honor your body with the foods it desires. These two approaches truly lead to eating and nourishing your body based on hunger and fullness and with the foods that it needs. Mindful and Intuitive Eating is not something I learned in my undergraduate studies. Instead, I learned about it during my own recovery. For over a decade, I struggled with an eating disorder. It was at my second inpatient treatment, as a dietitian, that I discovered Mindful and Intuitive Eating. At first, I was very skeptical about trusting that my body could tell me when it’s had enough food and when it needed more. In school, I learned about physiology, chemistry, and the energy and protein needs the body needed, based on calculations. However, I never learned that human instinct depicts how much nourishment we actually need. During my own mindful healing, I realized that as babies, we cry when we are hungry and push mom’s chest or the baby bottle away when we are full. When we start discovering foods, we ask for more of the foods we like and shy away from the ones we don’t. Achieving adequate nourishments comes from reconnecting with your body in a mindful and intuitive approach and are natural-born instincts. Focusing on Employee Health and Wellness, I noticed that so many people eat at their desks or workspaces, they leave their homes without breakfast and just a cup of coffee in hand, they graze or snack mindlessly while working, and eat their lunches engulfed in their work tasks. The importance of taking time to take an adequate lunch break or movement break has been lost and my goal is to make it a priority once again. Mindfulness is a fundamental part of my day. I work primarily from home (unless I am at a worksite), and with little to no interaction with others, mindfulness is essential to my mental and physical health. I make sure to walk away from my desk if I need a snack, I disconnect from my computer and phone when I take a break for lunch, and give myself 5 minutes of movement by walking around my house or stepping outside every one to two hours. These habits allow me to stay and optimize my focus and work productivity. I am much more successful in my work and in my personal life because of mindfulness. When I started my business, I had the mentality where I just needed to work, work, work. I ate at my desk, in the car, did not take time to interact with others, or take a moment to just breathe. When I found myself lost and stressed in my business, I realized it was effecting my health and my nourishment, just like it had 7 years prior with my eating disorder. I realized that I needed to go back to what had healed me in the first place — I needed go back to my mindfulness and intuition, and simply go back to me. Since integrating mindfulness back into my day and into my nourishment, my productivity and business success have not only improved, but so has my physical and mental health. In my Employee Programs and Nutrition Workshops, I always say that a healthier life starts by taking it one step at a time, one meal at a time, one day at a time. Find one thing you can do for yourself everyday — whether it’s enjoying a mindful meal, taking 5 minutes to meditate, or taking a moment to take 3 deep breaths. No ‘good life’ was created in a single moment or day and we need to remember to be patient to truly understand what our needs are and how to put ourselves and our health first everyday. It was a year into my life as an entrepreneur. I was working part time for someone that I did not realize was very toxic to my mental health. I took a moment to speak to a friend and meditation expert and we just talked, took deep breaths, and she guided me through a meditation. At that moment, through tears, I realized that in order for me to grow in my business and find my mental health again, I needed to step away from what was toxic. Reconnecting with myself mindfully and spiritually was the first step in leading me to what I do today as a Dietitian and Mindful and Intuitive Eating Practitioner. I have so many to be thankful for my success. It started by joining a mastermind of other like-minded business women entrepreneurs. We shared ideas, gave each other feedback, and motivated one another. Next, I have to thank a colleague and dietitian friend, Libby Rothschild, that I speak to daily, several times idea. We share business ideas, strategize for social media posts to create impactful messages, and support one another. I also have to thank my business coach (and now business partner) Amy Sowards. From the beginning, she never made me give up on my message or authenticity. Together, we created the Mindful and Intuitive Eating Practitioner Certification course so that other wellness professionals can share the message of bringing mindfulness and intuition into nutrition as well. Lastly, I have to thank my husband, Richard. He supported my entrepreneur journey from the very beginning. I quit my full time job from one day to the next and we, along with our toddler daughter, moved in with his parents while I pursued my dream. It is so important to remember that a healthy work culture is not only created by the employees, but by the environment that is created within the business. If the business is solely focused on numbers, sales, and productivity, and the employees are not the focus, then employee engagement and relationships will fail. From an employee wellness perspective, I find that most wellness programs are solely focused on biometric and anthropometric measures. An employee’s weight, blood pressure numbers, and physicals are the only factors addressed. However, it is important to create a culture of wellness, share different tools for different people to optimize employee health, and make note of what and if programs are being offered that will help to improve overall mental, physical, and emotional health. I am a sole believer that bringing Mindful and Intuitive Eating into the workplace will significantly change employee long term health for the better. Nutrition does not work if it is a one-size-fits-all approach or if there are constant messages that this food or that food is ‘bad’ for you. It is about creating a positive environment around health to engage and motivate employees to put focus on their health every single day. Healthier employees mean less sick days, improved productivity, and stronger employee relationships. People can find out more about me, my programs, and my Mindful and Intuitive Eating approach by visiting my website at: www.mindfullyintuitivenutrition.com and connecting with me on LinkedIn at https://www.linkedin.com/in/giselabouvier/ or Instagram at www.instagram.com/corporatenutritionist.